There are hundreds of solar companies in California you can choose from to make the switch to solar power. You could take your search national and find a larger company that services your area. At West Coast Solar, we believe in helping those looking to transition to a renewable energy source, and we understand how overwhelming the online search process can feel. In this post, we’ll share two more indicators of a good solar company through your online research. If you missed it, we shared the first two indicators in part one of this blog series. You want to find reputable websites that are collecting reviews to share with the public. Sites like the Better Business Bureau, Yelp, or Google. Avoid sites that get paid to collect and distribute reviews for companies. You want to trust third party sites that show unbiased reviews to customers so they can make the best decision for their situation. You can also look into the solar installation companies website, too. Most companies online will share customer stories, reviews, or testimonials to connect with potential customers. 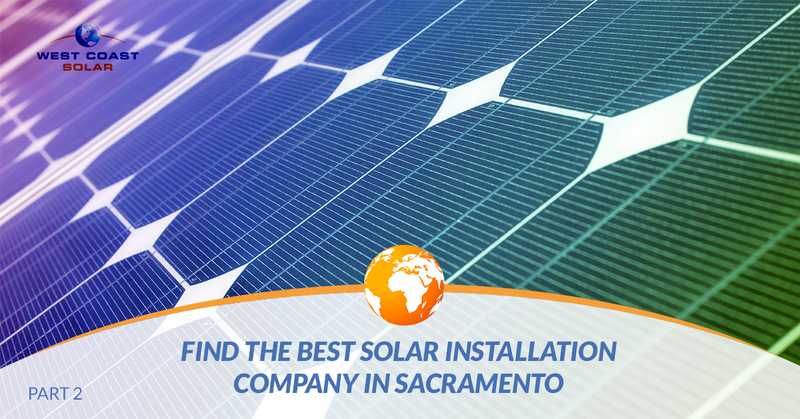 We promised ways to search for the best solar company in Sacramento online, but we also believe you need to take things offline. As a part of your research, consider making a few phone calls. The first should be to the solar companies you’re considering. Ask them how long they’ve been in business, how many solar systems do they install annually, who installs the systems for them, and if they’re willing to share 2-3 customer references. This general information will paint a better picture as to how the solar company operates, why they’re in business, and if you want to work with them. Did the solar company treat you right? How long did it take to install your system? Would you refer them to a close friend or family member? Simple yet direct questions will reveal a lot about a company, especially if you’re asking the company’s customers about their service and product. At West Coast Solar, we encourage our potential customers to shop around. Our mission is to keep solar simple, which ties directly into wanting to find you the best solar system for your Sacramento home. Our consultants, expert designers, and certified installation technicians are ready to help you make the switch to solar, and we take pride in being the best in the area. If you’re still shopping around for the best solar company in Sacramento, let West Coast Solar help! We’ve been serving Sacramento for more than 10 years now, and we’re confident our solar design, installation, and financing will help you make the switch to solar. Want to keep solar simple? Give us a call today! Read part one of this blog series if you missed it.